CheckBoxes allow the user to make multiple selections from a number of options. You can click a check box to select it and click it again to deselect it. CheckBoxes comes with a caption, which you can set in the Text property. To apply the same property settings to multiple CheckBox controls, use the Style property. 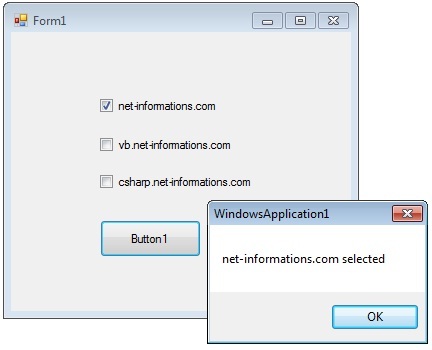 The following VB.Net program shows how to find a checkbox is selected or not. msg = msg & "   vb.net-informations.com"
msg = msg & "   csharp.net-informations.com"